When working at height in poorly lit conditions, our 2 point hi-viz restraint harness kit will make sure users are visible, safe and comfortable. With a reflective harness, adjustable lanyard and rucksack or kit bag included, it will be an ideal choice for various situations. 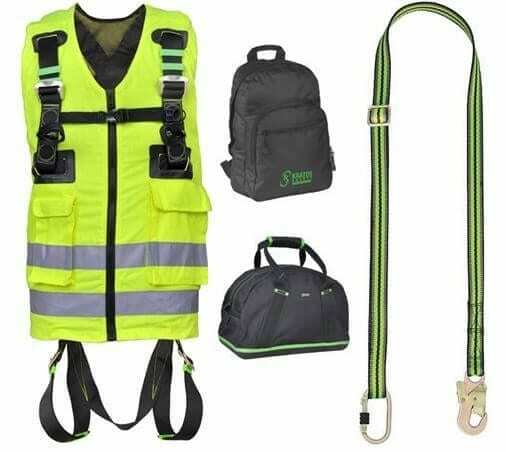 The main feature of this kit is of course the high visibility 2 point harness, which is finished in yellow and has silver stripes to ensure that the wearer can be seen from a distance, even if the levels of ambient lighting are low. Aside from this safety-enhancing vest system, the rest of the harness is similar in design to the other equipment we stock. It has adjustable strapping on the thighs and shoulders, a comfortable sit strap at the base and attachment points on the chest and the back. Meanwhile the webbing lanyard offers adjustability between 1.4 and 2 metres, with durable polyester material used in its construction. You can alter the length using the steel ring on the lanyard, while the snap hook system allows for quick coupling and detachment. If hi-viz is not something you are looking for in a restraint kit for working at height, you might be better suited by our 2 point scaffold kit or the premium model with an even comfier harness. To get all the guidance and information about the height safety equipment we sell, call or email Rope Services Direct today. Our phone number is 01384 78004 and you can find our rapid response form on the contact page to get an email reply. 2 Point Hi-Viz Restraint Harness Kit Overall rating: 5 out of 5 based on 6 reviews.